The banjo is a stringed instrument with, typically, four or five strings, a long fretted neck and a circular drumlike body overlaid with parchment – today drumheads. Its unique sound comes from vibrating the membrane of the body by plucking the strings with the fingers or a plectrum. The banjo is usually associated with country, folk, classical music, Irish traditional music and bluegrass music. The banjo we used is a 5 String Banjo with a 33 cm diameter mahogany body. We played and recorded the banjo in a number of ways to get the typical banjo sound – each in several velocity layer and 2 Round Robin variations. 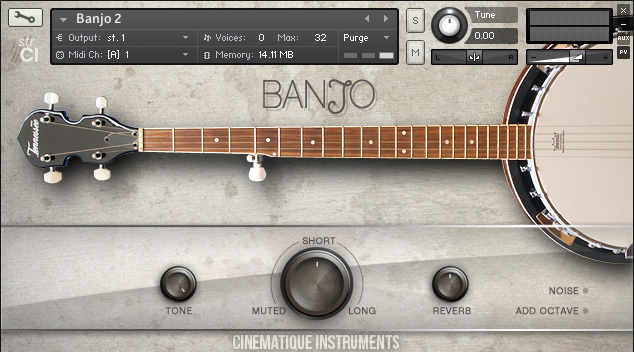 After editing and processing the samples we created a banjo patch which provides various styles of the Banjo, shorten notes feature, an octaver, a reverb knob and enhanced scripting. We also added the noises of strumming the banjo to this patch. As a result we came out with a very realistic and organic sounding Banjo. Update:In 2015 we updated the Banjo and put together all separate patches into one complex patch covered by a brand new GUI. It is now possible to play all different articulations in one patch.